The investigation into what happened will no doubt identify the concrete and immediate causes of the accident. However, it may not take into account the more indirect causes of the situation; the role played by the economic and political context that contributed to the steady increase of risks. For example, the price difference between the cost of a barrel of Alberta oil versus the cost of a barrel of foreign oil that is refined in Eastern Canada, like Irving Oil, has encouraged companies to find ways to cut costs. This has increased the shipment of oil by train by Canadian National, which saw rail traffic of oil tanks increase from 5000 cars to approximately 30,000 in 2012. . The Irving refinery is situated at the end of the rail system that is partly controlled by the American company Montreal, Main & Atlantic Railway (MMA), who own the track on which the train derailed. The MMA is a subsidiary of the Illinois company Rail World, a multinational specializing in “railways, consulting, and investment companies specializing in privatization and restructuring. Their goal is to promote rail industry privatization by bringing together government agencies who wish to sell their holdings to investment capital and expertise.” The privatization of profits and the socialization of risks are not benign, judging from the enormous losses suffered by communities like Lac-Mégantic. What’s more, municipalities have no power over train shipments through their territory. .
Negligence is not borne of chance, but a deliberate decision taken in order to maximise profits. Capitalist logic, closely linked to private ownership of the means of production, the defence of the market economy and the constant pressure to increase productivity is directly involved here. The director of MMA, Ed Burkhardt, told the magazine Eastern Railroad News that, following a bitter labour dispute with Canadian Pacific, MMA relied on a six day schedule, in the two directions, from Montreal to Brownville Junction (Maine). The company decided to save $ 4.5 million and to emphasise ‘efficiency’ by replacing its work teams with devices controlled at distance . The big boss of MMA, loyal partisan of trains run by a single employee, exerted pressure on the US Federal Railroad Administration and Transport Canada in order to get a green light for this practice – first in 2009 and again in 2012 . The fact that Canada has become a “petro-state” cannot be overlooked. An extractive regime oriented towards exploitation and the massive export of crude oil, tramples on the basic rules of democracy, public health, environmental protection and human rights. The massive Tar Sands project, one of the worst ecological catastrophes in the world today, relies on the active support of the Government of Canada. But this is not uniquely derived from the archaic ideology of Stephen Harper’s Conservatives; that ideology merely expresses in full force the neoliberal logic associated with globalization and market deregulation. The State is not simply caught in an economic system that requires it to encourage the flow of capital to the detriment of social and environmental standards; it makes possible this generalized exploitation through institutions, public policies and deregulation. The Neoliberal state obeys the principles of market competition by acting as facilitator (supports private investment), distributor (creating business opportunities) and competitor (reorganizing public services). The numerous omnibus bills confirms that the Canadian neoliberal state represents a “material condensation of power relations” willing to sacrifice liberal democracy to ensure the hegemony of a class of owners on communities dispossessed of any real economic and political power..
To pave the way for these neo-colonial petroleum projects, Canada is prepared to threaten the European Union (which wants to label bituminous oil as much more polluting than conventional oil) and Barack Obama (who seems averse to the proposed TransCanada Keystone XL pipeline, being ostensibly engaged in the fight against climate change). The principle arguments presented to tar sand adversaries are that pipelines do not increase the greenhouse gas emission rate, and the tar sands themselves are safe, they create jobs and opposition is fundamentally useless because oil will reach its destination in any case, whether by train or by truck. While the train derailment shows the danger of this mode of transport, it is no surprise that the Globe and Mail has co-opted the catastrophe for pipeline transport, ‘Quebec tragedy reminds us pipelines are the safest way to transport oil’. . The controversy around the reversing of Enbridge’s line 9B must be understood in light of this situation. Pipelines do not represent a real alternative to oil transport by train. First of all, they pose significant risks to drinking water and agricultural land; pipeline 9B crosses the Ottawa River, upstream from Montreal, where a leak could compromise the water source of 2 million people. Secondly, the Enbridge record on the reliability of its installations is disastrous; the Polaris Institute shows that the company is responsible for 804 spills in North America between 1999 and 2010. An average of 73 accidents per year: shouldn’t that reassure communities? Thirdly, even though multibillion dollar companies like Ultramar claim that the transportation of oil by train is 40 times more risky than pipeline transport, the fact remains that the latter spills three times more oil than the former. Despite the reassuring rhetoric from the industry that underlines the minor and easily reversible nature of its spills, “the president of the Executive Committee, Josée Duplessis, notes that even if Enbridge has been using its pipeline between Montreal and Sarnia for 37 years, it has never shared its emergency plans with the municipal authorities”. That is why the City of Montreal has expressed serious reservations about the pipeline reversal in a letter submitted to the National Energy Board public consultation . In the meantime, Enbridge continues to give bribes and kickbacks to North Shore Montreal municipalities, either in the form of gifts of $10,000 (Mirabel), the purchase of VTT ATVs (Saint-André d’Argenteuil), the financing of events such as corn roasts (Montreal-Est) or the Enbridge Fishing Festival (Boisé Belle-Rivière). Unfortunately, the three main parties on the Quebec national scene are solidly hooked on neo-liberal oil logic. Even the Parti Québecois, fervent defender of ‘sovereignty association,’ is basing energy independence on the exploitation of fossil fuels in Quebec, in ‘partnership’ with Alberta oil. However, this obsession with state revenues is not a situational phenomenon, resulting from poor decisions of politicians. It is instead a structural fiscal crisis, caused by the obsession with a zero deficit that leads to major cuts in public spending (austerity). These measures do not permit the stimulation of growth, but rest upon household consumption causing revenues to stagnate and depend on credit and debt. These become the principle methods to soften the crisis. However, as debt has objective limits (capacity to pay) and subjective limits (tolerance for over-indebtedness), the “financial recovery” in Quebec and Canada is doomed to remain prisoner to an austerity and stagnation trap . Despite ostensibly sound management of expenses (austerity), state revenues continue to fall (stagnation), which again necessitates new compressions and measures of restructuration, ad nauseum. The first remarks that the water is not toxic, merely cold. The second considers that the risks of a heart attack are low, because the woman is in good health. The third estimates that it is possible to swim across the river because it is not very deep and has no rapids. Finally, the fourth suggests she cross the river because the risks are minimal compared to global warming, destruction of the ozone layer and the loss of biodiversity. 1) It is not acceptable to threaten the physical integrity of human and non-human communities if there exist reasonable alternatives. 2) Nobody can define for someone else what is an acceptable “damage”. 3) We must consider and implement the least damaging alternatives for the current population, future generations and ecosystems. 4) It is difficult to think of alternatives to the status quo because individuals, businesses and governments have interests to preserve. 5) The essential prerequisite for political change is to recognise that there are alternatives. 6) Real changes in harmful behaviour and habits of individuals and communities (dependence on oil, urban sprawl, overconsumption, etc.) cannot be reduced to ethics and individual responsibility; they must be accomplished through political action. The Lac-Mégantic disaster raises an alternative: energy transition. This means a shift from an energy system based on non-renewable resources (oil, gas, nuclear) towards a development model using renewable energy: solar, wind, geothermal, biomass, etc. This transition would not be limited to the type of resources used, but would involve changing the energy structure. It would require the passage from a mode of production based on increasing demand for energy, to the establishment of a mode of production based on reducing energy use. A real transition therefore involves substantial behavioral, economic and political, socio-technical transformation. To bring about a social change of this magnitude, it should be considered comprehensively and concretely, that is to say, within the dynamics of Quebec society. The implementation of the proposed energy transition project must be preceded by an analysis of the situation and the balance of forces that takes seriously the social, cultural, institutional, and economic policies that hinder such development. But the historical and geographical analysis of this situation would not be complete without identifying the primary struggles related to energy issues. This is why the contributions of social movements, citizen mobilisation and coalitions against hydrocarbons (shale gas, oil sands, pipelines) can highlight both the challenges and the real possibilities for alternative energy. The disaster at Lac-Mégantic cannot not be resolved by a strict inquiry, individual accusations, some superficial regulatory modification and false promises of security. This episode is not just a technical problem, but is a springboard for social mobilisation, for political action aimed at both ecological transition and the liberation from the yoke of unscrupulous big business and their accomplices in the Canadian State. This statement was first published in the francophone webzine Presse-toi à gauche on July 12, and le Réseau écosocialiste published an English language version on July 25. Le Réseau écosocialiste was founded on March 9 under a basis of unity that includes the following focal points: 1) Global resıstance to neolliberalism in crisis; 2) ecosocialism as a response to the impasse of capitalism; 3) the conditions for realizing ecosocialist perspectives; 4) the tasks of the Ecosocialist Network. François Desjardins, « Croissance sans précédent du transport de pétrole par train », Le Devoir, [En ligne], http://www.ledevoir.com/societe/act&#8230;, 8 juillet 2013. Nick Sambides Jr., « MMA Railway using remote control », Bangor Daily News, [En ligne], http://bangordailynews.com/2011/04/28/opinion/%E2%80%A6-and-the-conflicted/, 29 janvier 2011. 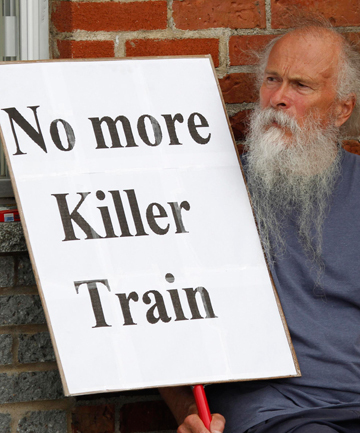 Keith Stewart, « Is the oil industry using unsafe rail cars to transport crude ? », Greenpeace Canada, [En ligne], http://www.greenpeace.org/canada/en/home/, 21 mai 2013. Diana Furchtgott-Roth, « Quebec tragedy reminds us pipelines are safest way to transport oil », The Globe and Mail, [En ligne], http://www.theglobeandmail.com/comm&#8230;, 7 juillet 2013. ». Martin Croteau, « Enbridge : Montréal émet de sérieuses réserves sur l’inversion du pipeline », La Presse, [En ligne], , 5 juillet 2013. Alexandre Shields, « Politique énergétique – Québec veut le pétrole sans les GES », Le Devoir, [En ligne], http://www.ledevoir.com/environneme&#8230;, 5 juillet 2013. Éric Pineault, Cette fois, est-ce différent ? La reprise financiarisée au Canada et au Québec, Rapport de recherche, Institut de recherche et d’informations socio-économiques, juin 2013.